Turn To God w/ Carin -"My Dear Rosa Jean,"
In “Turn to God with Carin,” Carin Jayne Casey continued with her monthly review of "My Dear Rosa Jean," beginning with a brief refresher of what was covered in Episode #23 (2/6/17) and Episode #27 (3/6/17). In Chapter 3, Brad, always galloping along with their relationship, suggested they each donate a certain dollar amount into a down-payment on a house. This seemed fair to Rosa Jean since she and her prior husband had done this, and it had been a fair agreement. But Brad had ... Maggiori informazioni betrayed her! Once they were at the table on closing day, her money alone went into the pot. Casey read portions of pages 50 and 58 from "My Dear Rosa Jean" regarding this heartbreaking betrayal. The engagement proposal was also mixed with deceit, always presenting to her happiness mixed with sadness - a two-edged sword. Rosa Jean confessed to her Aunt Grace that she had turned her back on God before she met Brad. Having failed at her prior marriage, and her young adult children now living in another state, Rosa Jean was depressed. She quit going to church, then quit reading the Bible or singing praises - singing at all. And, almost without notice, she had quit praying. The question was asked, how important it was how Aunt Grace reacted to Rosa Jean's story. Easily, Aunt Grace could've been critical or judgmental, but instead she was supportive. She showed Rosa Jean unconditional love and empathy, supported by the Golden Rule and other scriptures. Casey reminds us that "death and life are in the power of the tongue..." and read Psalm 23, "The Lord is my Shepard..."
Contact information was given for the Virginia Sexual & Domestic Violence Action Alliance and for the National Domestic Violence Hotline. 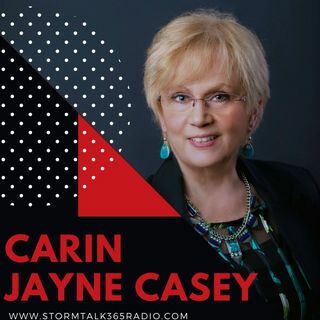 Casey mentioned her new podcast, "Abundant Living with Carin" that airs every Tuesday at 7:00 am.